A little parody from Microsoft. Gmail is a bit creepy, when you think about it. Sort of like an SNL skit, this internal Microsoft video shows what they really think of Gmail. Are you creeped out by Gmail ads or do you think Microsoft is woefully out of touch with what people think/feel? Which Industry Is Buying iPads Like Crazy? The iPad is still primarily a consumer product, but it's making inroads into businesses as well. Especially in the financial sector. According to a report by Good Technology, which manages mobile devices for thousands of big companies, almost HALF of new iPad activations during the second quarter of 2011 were from the financial services industry. 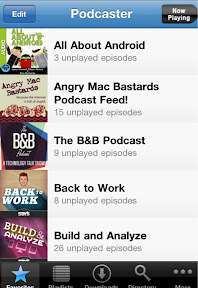 I've been using the Podcaster iPhone app for a few months now. 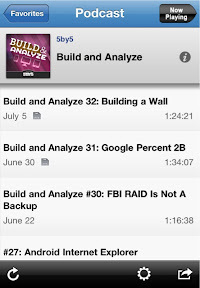 Great app for subscribing and listening to podcasts (audio and video). You can search the directory or subscribe by URL. Best part is you can do all this without ever hooking up to a computer. James E. Powell on a potentially troubling trend among network security professionals. I see the need/demand for more and more bandwidth, but at the expensive of security? A new survey of 478 security professionals and C-level executives reveals that IT security pros are responding to increased network traffic by turning off functionality in their security solutions. Despite the increasing number of risks posed by a variety of recent data breaches and attacks, 90 percent of respondents admit that they make the security/throughput trade-off. It’s not that these IT professionals don’t understand the problem; they understand the growing impact of mobile devices, for example. Despite a majority (67 percent) admitting that security trumps performance in security solution evaluations, 81 percent say they turn off functionality because network performance was negatively affected. Even when they adopt “next generational firewall” (NGFW) products, Crossbeam says security pros have to select which features to allow so they can meet network performance goals. From Microsoft's Simon May. Does MS get it (IT)? This is the same principle as the common “lemon battery” experiment. Using two different metals, a voltage can be created because of chemical reactions. Whitson Gordon with The Top 10 Ways To Speed Up You Computer's Boot Time. This article focuses on boot time, but I think fixing a slow computer is a more critical need for most users. Here are my top three tips for speeding up a slow computer. Increasing the amount of RAM is always a good fix for slow computers and probably my number one suggestion. Make sure you don't overpay for the RAM or the installation. Memory will usually be much more expensive from the PCs' manufacturer - crucial.com is a good alternative I've had success with. If you're technically inclined, there are lots of installation resources available online (especially YouTube). If the poor computer performance is a recent symptom, it's time to check for viruses and malware - often the cause of a slow computer. Periodically checking and pruning which applications launch at startup (I usually use MSCONFIG) is a great way to limit them amount of RAM consumed by often unnecessary applications. When we think of being connected to the Internet, our minds immediately shift to our computers, phones, and most recently tablets. This week at Cisco live, I shared that in 2008, the number of devices connected to the Internet exceeded the number of people on Earth. That’s right. There are more devices tapping into the Internet than people on Earth to use them. How is this possible? The infographic below provides a visual representation of the increase in “things” connected to the Internet. With this increase, how will you prepare your network for the future? Every Leica lens is hand-crafted and goes through meticulous manufacturing processes to uphold the quality and precision that Leica defines and customers have come to expect. In the age where technology almost inevitably means mass manufacturing, Leica products are still made with exacting precision by the hands of highly-trained technicians. This video gives you a behind-the-scenes look at the craftsmanship and making of Leica lenses in the production facilities of Leica Camera AG. David Sarno on the two Apple patents that the ITC (International Trade Commission) recently ruled HTC has infringed. When we think of smartphones, we think of touch screens, software apps, wireless radios, Bluetooth and other recent inventions. But the patents at issue here go back way further than that. The first one, 6,343,263, was filed in August 1994 -- 17 years ago -- and covers "Real-time signal processing system for serially transmitted data." Meaning, roughly, it handles data ("voice, facsimile, video and the like") being sent to it from other devices over a network. There is no mention in the patent of wireless networks, cellular phones or really anything you'd directly associate with a smartphone except the sending and receiving of data. You can imagine that many -- or all -- smartphones would need to be able to receive and process real-time data from outside sources, so whether Apple's infringement claim on it will stop at HTC, or Android, or anywhere, seems to be an open question. The second patent, 5,946,647, was filed in February 1996, and treats an even more generic subject: System and method for performing an action on a structure in computer-generated data. What's that, you ask? Well, if you open an email on your HTC touch-screen phone, you are in fact using your finger to interact with a piece of data. By touching it, you are commanding the phone to perform an action (like "open") on the email. This patent has to do with the system that, for instance, tells the phone to open the email. This stuff is pretty fundamental to the way most smartphones -- actually, most computers -- work these days. That's why there's so much speculation about how a ruling in Apple's favor could be problematic for many other manufacturers. "This is basically Macintosh-related technology," said Florian Mueller, an intellectual property watcher who has been closely following the smartphone patent wars. (Apple has been developing the Macintosh line since the early 1980s.) In smartphones, he said, "we see a convergence of computer hardware and software and the mobile communications industry." "And that's why the patent problem is such a mess," Mueller added. "The vast majority of the patents in a smartphone are computer hardware and software patents -- mobile communication is just a minority." Forty-three percent of grades are A’s at a wide range of colleges, concludes a study published in Teachers College Record. That’s up 28 percentage points since 1960 and 12 percentage points since 1988. Less than 10 percent of grades are D’s and F’s. Grades are highest at private colleges, liberal arts colleges and selective and very selective institutions. Grades are lower at science and engineering schools and less selective institutions. I watched Despicable Me recently on the iPad. Very good movie. I was even more impressed with HBO Go, the free iPad application - for HBO subscribers - that allows you to watch movies, series and specials from HBO. This is a screenshot I took - when the main character goes to the bank to see funding for his latest evil plot. Great advice from slideshare user vinamaria. A great slideshare presentation from Enrique Garcia Cota. In case you didn't read all of Matt Blaze's article, here's his explanation of why wiretapping wins out over encryption. [a government eavesdropper can] exploit the fact that the cleartext (or the keys to decrypt it) for almost all encrypted traffic today is typically available, somewhere, on a general-purpose computer that is exposed to government access, either explicitly or through surreptitious means. And as systems become more sophisticated and incorporate more features, the exposure of cleartext and keys to third party access tends to increase correspondingly. Take, for example, that most ubiquitous instrument of criminal (and legitimate) communication, the cellular phone. In the 1990's, most cellular calls were transmitted over the air as unencrypted analog signals, easily intercepted, by police and curious neighbor alike, with an inexpensive radio receiver. Today cellular signals are almost always encrypted, making over-the-air interception a losing proposition. But the 2010 wiretap reports tells us that the majority of law enforcement wiretaps were for cellular calls, and that encryption was not a barrier. This is because, by 2010, investigators had moved on from over-the-air interception. They found ways instead to tap cellphones at the endpoint where plaintext is available (in the cellular phone company where the call connects to the wireline network). Matt Blaze with some interesting stats and analysis on cryptography and wiretapping. The article is worth reading in its' entirety. The 2010 U.S. Wiretap Report was released a couple of weeks ago, the latest in a series of puzzles published annually, on and off, by congressional mandate since the Nixon administration. The report, as its name implies, summarizes legal wiretapping by federal and state law enforcement agencies. The reports are puzzles because they are notoriously incomplete; the data relies on spotty reporting, and information on "national security" (FISA) taps is excluded altogether. Still, it's the most complete public picture of wiretapping as practiced in the US that we have, and as such, is of likely interest to many readers here. We now know that there were at least 3194 criminal wiretaps last year (1207 of these were by federal law enforcement and 1987 were done by state and local agencies). The previous year there were only 2376 reported, but it isn't clear how much of this increase was due to improved data collection in 2010. Again, this is only "Title III" content wiretaps for criminal investigations (mostly drug cases); it doesn't include "pen registers" that record call details without audio or taps for counterintelligence and counterterrorism investigations, which presumably have accounted for an increasing proportion of intercepts since 2001. And there's apparently still a fair bit of underreporting in the statistics. So we don't really know how much wiretapping the government actually does in total or what the trends really look like. There's a lot of noise among the signals here. But for all the noise, one interesting fact stands out rather clearly. Despite dire predictions to the contrary, the open availability of cryptography has done little to hinder law enforcement's ability to conduct investigations. Since 2002, the annual wiretap report has included a curious statistic: the number of times law enforcement encountered encryption on an authorized tap, along with the number of times that this prevented them from getting the evidence they were seeking. So how did encryption fare versus wiretapping? Not well! the latest wiretap report identifies a total of just six (out of 3194) cases in which encryption was encountered, and that prevented recovery of evidence a grand total of ... (drumroll) ... zero times. Not once. Previous wiretap reports have indicated similarly minuscule numbers. Write down every object that you use in one day that is all or part plastic. Also write down a list of the objects that you use that day that contain no plastics. Maybe even share your list with all of us. Plastic dominates our life to such a degree that we hardly notice it anymore. Our post-industrial information economy runs on plastics made from petroleum products. And what is amazing is that our plastic economy is a fairly recent development. You are related to people who grew up in a non-plastic economy. Plastic: A Toxic Love Story covers the history, science, economics, and politics of plastic. ... Freinkel's biography of plastic makes for a good story, and she tells it with the right balance of personal antidote, storytelling, and reporting. Casey Johnston on a promising wireless technology. Great potential, but some limitations need to be addressed for this to anything but a niche technology. WiGig is a specification for hardware that uses 60GHz frequencies to transmit up to 7 gigabits of data per second over the air; for comparison, 802.11n WiFi tops out at a few hundred megabits per second. The WiGig Alliance recently pegged the launch of capable devices for the first half of 2012. WiGig is sufficiently advanced to have its own IEEE 802.11 standard, coded as 802.11ad. Using it at the time of release will require some new hardware both to send and receive signal, similar to when 5GHz started to make its way onto the market. Unlike 5GHz WiFi, though, WiGig's design includes methods for avoiding the decay problems that higher-frequency transmissions usually have. To overcome signal decay, WiGig uses a process called adaptive beamforming (it's not the first or only system to do so, but is heavily reliant on it). With a combination of physical antennas on the devices and algorithms to tune the signal, WiGig devices effectively shoot their signals back and forth at each other in a narrow, targeted beam. There are problems though, particularly with mobility, range and obstructions. we're not sure we'll be able to stroll around holding our WiGig-capable devices and maintain the 60GHz signal. Still, the specifications say the equipment must be able to fall back on 2.4GHz and 5GHz signals in the event that it loses the higher-speed connection. Mobility isn't the only downfall of WiGig, though—according to the WiGig Alliance, the beamforming of compliant equipment needs to be within line-of-sight of receiving devices in order to work well. Even a person stepping between two communicating devices can break the signal, though according to a whitepaper by the group, WiGig-compliant equipment can bounce beams off walls and ceilings in order to reach between devices. According to the specifications, devices can work over distances "beyond 10 meters," but it seems walls and ceilings will be an even bigger obstacle for 60GHz WiFi than they already are for 2.4GHz and 5GHz signals. On the surface, the following story from Inside Higher Ed appears to indicate that a student at the University of Minnesota was disciplined for posting tasteless and even offensive jokes on her personal Facebook page. The Minnesota Court of Appeals has upheld the right of the University of Minnesota to discipline a student in a mortuary sciences program who posted jokes about a cadaver on a Facebook page, Minnesota Public Radio reported. The student argued that the First Amendment protects the posts, but the appeals court found that the university could take action if it could "reasonably conclude" that the Facebook postings would "materially and substantially disrupt the work and discipline of the school." My first impulse was - "this a slippery slope", "If a student can be disciplined for offensive comments, could a student or faculty member be disciplined for posting comments critical of the institution"? But a closer reading of the Minnesota Public Radio story the article links to tells a different story. The Inside Higher Ed account omits the fact that the student apparently threatened someone in one of the Facebook posts. Who knew embalming lab was so cathartic! I still want to stab a certain someone in the throat with a trocar though. Hmm..perhaps I will spend the evening updating my "Death List #5" and making friends with the crematory guy. I do know the code . . . . The court makes clear that "the university's substantial interest in protecting the safety of its students and faculty" was an overriding factor in the decision. [The student]1 also argued that the U of M didn't have authority to discipline her because the activity to which it objected took place off campus. "Whether or not [name removed] intended her posts to be satire or mere venting does not diminish the university's substantial interest in protecting the safety of its students and faculty and addressing potentially threatening conduct," the Court of Appeals said. It added that in these times, schools need to watch for and respond to student behavior that indicates a potential for violence. I expect better from Inside Higher Ed. 1) Check out the Google + Guide that is being created by hundreds of Google users, using Google docs. How Google Coolgle is that??? Imagine what kids could do if we allowed them to use social networks to connect with others and make guides about things they cared about??? 2) Eric Curts, who I was fortunate enough to have join my first hang out, shared with me a whole blog post he wrote about his ideas for Google + for schools which you can read here. If you're a Google Apps school, you'll love his App User Group which connects and assists schools in the use of Google Apps for education. His post was also mentioned on the Read Write Web blog in their article, "Is This the Social Tool Schools Have Been Waiting For? by @audreywatters . Check it out. 4) Visit Larry Ferlazzo's round up of Google + resources here. Here is what I like, love, a great tip, and what surprised me about Google +Top 3 things I like. You can select who sees your message. I REALLY like this as I know my friends are annoyed by my work chatter. Hangouts are really cool. They're so easy. I didn't need to install or do anything, though I believe this is because I use the Google Suite. If you don't, you may need to install some plug ins. Creating circles. I don't know why but this seems so much better than creating groups in Facebook. Google+ completely changes the photo sharing game. Not just a little bit — alot. This may be the most significant shift in photo sharing that we’ve seen since the introduction of Flickr. There is more engagement going on with photographs on G+, more ways to share photographs on G+, and it is growing at a rate that blows my mind away. Photos are elegantly presented as large oversized thumbnails in stream views (in contrast to Facebook’s stingy microscopic photo thumbnails that I’ve never quite understood). When you click through the photo you get the most elegant lightbox view (on black) of any photo sharing site out there today. Harold Jarche has some key takeaways from his reading of Malcolm Gladwell's Outliers (see below). He also does a great job of linking these ideas to Daniel Pink's concepts of Motivation 3.0.
aspires to be the premier organization for developing future African-American and Hispanic college students who are interested in pursuing career paths in science, engineering and technology. ... PACE fosters academic and career excellence with the primary purpose of developing future generations of scholars, professionals and entrepreneurs who will positively shape their communities. Like Steve Jobs and Bill Gates, You were born at the right time. Even though you can't see it now, you are living in and starting your education and your careers in an extraordinary era. The Internet, mobile devices, the post-PC era - it's all happening as we speak. You have before you unprecedented opportunities - you can be the next Steve Jobs, or Bill Gates or Mark Zuckerberg - you can create the next iPhone or the next Facebook. But - and this is a big but - these opportunities are meaningless if you're not prepared to grab them. What does this mean? It means work! It means the 10,000 hour rule - 10,000 hours of disciplined practice to get better. Michael Jordan's natural abilities didn't make him a great player - he was also the hardest worker on his team. He practiced more than anyone else on his team - not in the areas where he excelled, for example dunking - but in the areas where he knew he needed to improve - his jump shot and defense. Through hard work, Jordan became a deadly jump shooter and probably the best defender in the game. If you find yourself struggling with Calculus, Chemistry or C++, then immerse yourself, dedicate yourself, put in those 10,000 hours to become the best! So while this is a day to celebrate your accomplishments and look forward to the next chapter in your lives, it's also a day to rededicate yourselves to the hard work and perserverance that got you here and will take you into the future. When and where we were born have a significant impact on our chances for success. Just being intelligent or creative is not enough. We need chance to favour us; such as reducing competition during periods of low birth rates, or to be born early in the year so that we physically develop ahead of our peers and are perceived as “better”. It takes a long time to develop deep skill in an area, about 10,000 hours, says Gladwell. The advantage is to those who develop these skills just before they come into great demand, like computer programming before the 1980′s or tailoring prior to an explosion of the garment industry. Like being born at the right moment, timing is everything. Those three things – autonomy, complexity, and a connection between effort and reward – are, most people agree, the three qualities that work has to have if it is to be satisfying. It is not how much money we make that ultimately makes us happy between nine and five. I became a Google + user this week and I like it. From what I can tell it lets you do pretty much everything Facebook lets you do with some bonuses including being able to edit your status updates and comments and that you can select who the feed goes to via the circle(s) in which you share your updates. The circles I'm using are colleagues, co-workers, GTA, friends, family, volleyball. The status updates still don't have a feature which I really want: nesting of comments. Is that really so hard??? It does let you tag people in your status which I find useful. If you, or someone you know, is wondering how cells can be used for learning, this guide from the authors of Teaching Generation Text will give you some ideas to get started. Taylor Martin - Why I switched from my ThunderBolt to an iPhone 4. One area the ThunderBolt has always struggled has been with software stability, and that could easily be said about most other Android devices, especially HTC-made phones. Sense UI is bug-ridden and known to be the culprit for lag and battery drains. The likes of custom ROMs proved to be no better as development for the 'Bolt has hit quite a few road blocks over the months. Little needs to be said here. Android is notorious for poor battery life. Although I tweaked my ThunderBolt seven ways to Sunday (I tried out new ROMs, kernels, radios … everything), the battery life never changed drastically. There was a time or two that I squeezed about 19 hours out of my ThunderBolt battery, but that was mostly standby time. I need something that will last through a day of heavy use, and BlackBerry 6 will no longer cut it for me. Cisco is planning to fire as many as 10,000 people, Bloomberg reports. According to the plans, which have yet to be finalized, the company will can 7,000 employees by the end of August. Another 3,000 have accepted buyouts. These cuts are far greater than the ones Cisco announced on its last disastrous earnings call. They represent 14% of the company's workforce and are designed to boost Cisco's earnings growth, which has been disappointing as sales have fallen below expectations. Cisco is getting its clock cleaned not only in its consumer division, which recently featured the shuttering of the "Flip" camera division that it bought for $590 million two years ago, but in its core enterprise business. The company is being undercut on price by likes of Juniper and HP. Once celebrated for its extraordinary management and consistent growth, Cisco's fortunes have changed radically in recent years. Just scale up the phone apps. Seems lazy. Given that it can’t do much in the short term about the lack of Android tablet apps, Google is tackling one piece it can address: making Android phone apps look better on larger screens. In a posting on its developer blog on Monday, Google announced plans to improve the appearance of phone apps with the next version of Honeycomb. Specifically, Google plans to offer two options to tablet owners looking to display apps that have not been optimized for Honeycomb — either stretching the app to fit the larger screen or zooming in. Elaine Pofeldt offers 5 Daily Habits Of Successful Entrepreneurs. Great advice for everyone - not just entrepreneurs. I'm a big believer that we should be teaching our students entrepreneurship. Not just our technology and engineering students, but all students. Don't you want to empower our kids to take their passions and make something of them? I do! Where do we start? Unfortunately it may not be with our business schools. Nathan Furr has some interesting thoughts on entrepreneurship - particularly on the failure of our schools to teach it. Does it seem strange to suggest that business schools struggle to teach entrepreneurship? Many business schools today have entrepreneurship programs that are growing every year. So how can I claim that business schools struggle to teach entrepreneurship? Take a peek back at history and you will see why I can make this claim and what it means for how we teach entrepreneurship. Do You Know Where Business Schools Come From? Once business schools were formed, what did was taught at business school and who taught it? Of course b-schools taught management: meaning, how to coordinate, how to plan, how to increase efficiency, and how to optimize. Ultimately, the challenge was to train people how to manage a large organization attempting to execute on a largely known problem, like making more textiles or autos. Where Does Entrepreneurship Fit In? Entrepreneurship was not really a topic in business schools at all until recently. Just as entrepreneurship wasn’t a serious topic in mainstream economics and sociology until the last few years, entrepreneurship only emerged in business schools recently after a resurgence in rates of entrepreneurial founding and a burst in technical innovation. Indeed, entrepreneurship didn’t really exist in business schools until the 1980s and only recently has become a mainstream topic. Not surprisingly, the emergence of entrepreneurship in business schools has followed a similar pattern to the emergence of business schools themselves. Indeed, after being ignored so long in business schools, the natural question became, when we teach entrepreneurship, what do we teach? The answer provded surprisingly simple. ... many people assumed that entrepreneurial firms are simply smaller versions of large firms—a context in which our existing idea apply, perhaps with some modification. That meant that many of our ideas about how to manage large firms spilled into our ideas about how to be an entrepreneur. So for example, strategic planning for the large corporation became business planning for the small business. The divisionalized corporate management team structure (consisting of a VP of Sales, a VP of marketing and so forth) became the defacto structure for a new venture. The product development model in a large business became the model for new business development. ... In short, most of our ideas about how to [sic] teach entrepreneurship were subtly borrowed from how we manage large firms. (If you are interested, I can share my three generations of entrepreneurship education presentation which elaborates on this). But remember, as I suggested in earlier posts, entrepreneurial firms and entrepreneurial problems are about something very different than management. Entrepreneurship is about tackling unknown problems or solutions, whereas management is about tackling known problems. As a result, rather than managing for execution, startups manage for radical exploration and that means the process to do this, even the people to do it, are radically different than for managing known problems. It is only in recent years that the entrepreneurial community woke up and began to argue that the paradigm is broken. When you are tackling something fundamentally unknown, you can’t “plan” your way to success—doing so leads you to be overconfident in your guesses. On PCs, as discussed in the March 13th Monday Note, the idea, an old one, is to have a “mini-OS” that’ll boot much faster than Windows so you can quickly check your webmail or your Facebook page. Printers would get better a nicer touch-UI. All this leading to grand statements of a boon for application developers: 100 million devices! Write Once, Run Everywhere! Neat theory, unclean reality. Just take a look at applications written for smartphones when playing on a tablet. iPhone apps do run, technically, on an iPad. And developers prefer rewriting those to better use the full screen. And what about code written for a Pre smartphone running in a printer, or a PC laptop using WebOS in a “quick-boot” arrangement? We even hear rumors HP might do a Windows 8 tablet after all. No warranties expressed or implied. In any event, this is a sad display of a once and still mighty company badly messing up its WebOS and TouchPad messages. The reality is simpler — and harder: HP decided to enter the smartphone/tablet fray. It thus competes with Android and iOS. The consumerization of IT renders the “enterprise-only” pivot null and void. In this new world, Google and Apple wage an ecosystem war: devices + apps + distribution. Add marketing, if you want, but Word Of Mouth is still more potent than ad dollars. Or merely reinforces it. This is the war HP is in. Bragging, pivoting or denying will only hurt. MacBook Air + iCloud = iCloudBook? What sort of notebook would Apple have made if they’d come up with this “build a machine with the assumption that its user has access to a tailor-made Internet and a cloud service” idea themselves? The question is of no particular interest. Apple thought of it, and Apple built it: it’s the 11-inch MacBook Air. Apple just couldn’t call it the iCloudBook when it was released last October. The cloud service that caused the machine to suddenly make perfect, elegant sense was still eight months away from its public unveiling. And when the 11-inch Air was released last year without the added context of iCloud, it made only a little more sense to me than the Chromebook does today. Oh, yes, I loved it and I regretted having to return Apple’s loaner after I finished my review. The advantages of a fully-functional Mac that’s barely larger than a comic book are immediately and intensely compelling whether I’m fleeing the office for just a few hours or fleeing the country just until the FBI has stopped subpoenaing witnesses to testify against Whitey Bulger. I didn’t quite get it back then. Why would Apple even bother making such a niche MacBook… particularly one that came with so many tradeoffs? No, they should have kept things simple and produced just the updated 13-inch Air. At $1299, it’s too expensive to compete with the MacBook Nothing or the iPad and it’s and not powerful enough to compete with the similarly-priced MacBook Pro. Okay, well, I was just plain dumb. Today, I can belatedly identify the 11” Air as Apple’s first public salvo in their cloud strategy. Let’s do the math on the 64-gig drive that I originally thought was a complete dealbreaker. Apple has said that iCloud’s 5 gigabytes of free cloud storage will be plenty for most people, if photos and media don’t factor in. That’s reasonable; it seems unlikely that anybody would buy an iCloudBook to do video or audio editing, and those are the kinds of projects that consume huge tracts of disk space. So let’s figure on less than 5 gigs of user documents. It’s so very clear to me now that just as Superman is the living ideal of Truth, Justice, and the American Way, the 11” Air is the tangible ideal of iCloud. You grab it when you leave the office and that’s it. No syncing, no updating, no need to trust that you’ll find WiFi when you get to where you’re going: iCloud kept your iCloudBook’s files up-to-date as you were updating them on your iMac so you’re already good. Thanks to the fact that your iCloudBook is a Mac OS device, you won’t need to transmogrify your files between mobile and desktop app formats, as you often must with an iPad. Instead, you can use the same familiar software you’ve got on your office machine. And if you’re missing an app on your iCloudBook, no worries: connect to the App Store and click a button to install it. All of the work you create and edit on your iCloudBook will have automagically shown up on your home and office Macs when you return. And if our math holds, there’s plenty of free space available to buffer whatever new media or data you happen to acquire along the way… but not so many superfluous gigabytes to jack up the price. Caption: Georgia Tech School of Electrical and Computer Engineering (ECE) professor Manos Tentzeris displays an inkjet-printed rectifying antenna, or rectenna, used to convert microwave energy to DC power. This rectenna grid was printed on flexible Kapton material and is expected to operate with frequencies as high as 10 gigahertz when complete. Researchers at Georgia Tech have found a way to harvest energy from electromagnetic waves in the air. The harvesting devices are produced using an inkjet printer and can collect small amounts of power from a wide band of frequencies--everything from FM radio up to radar. The technology isn't new—researchers have floated concepts (and a few devices) that can harvest energy from ambient WiFi signals and other small sources, but these are usually able to pull power only from tiny slices of the electromagnetic spectrum (perhaps just a few KHz). The new system can draw energy from much wider electromagnetic swaths: 100MHz to 15GHz. Even better, the sensors that harvest the energy are simple to make. To print the circuits on paper or paper-like polymers, the researchers use an inkjet printer and add an emulsion of nanoparticles. Circuits printed on polymers are currently less advanced, but the scientists say they have a wider range and can harvest energy from frequencies up to 60GHz. Gadgets such as cell phones could one day use residual radio signal to supplement their own batteries, but the amounts of energy harvested are small (on the order of 50 milliwatts) and the system won't currently make even small consumer devices self-sustaining. However, if the energy is allowed to build up in a small capacitor, it could temporarily power low-energy intermittent devices like temperature sensors or could supplement other energy-gathering mechanisms like solar panels. The harvesters could also function as mission-critical stopgaps, allowing a system to maintain essential functions or send out a distress signal until it can be fixed. James Brewer with some thoughts that should be troubling to educators. Why I'm Not Majoring In Computer Science. This is something that has been on my mind for a few years. I ask educators - "What's your special sauce?" - meaning what do you do that makes coming to your class or taking your program valuable? If I can learn enough HTML from YouTube, why do I need to take a web development course? If the the Internet knows more about AJAX than my instructor, why do I need an instructor? I consider hacking on cool software projects to be the most awesome thing in the world. With that said, you should know that I'm not a computer science major. In fact, I decided that I want to study applied mathematics during my time at university. Why? Well, to put it simply, I can teach myself computer science easier than I can teach myself math and I think math is absolutely fascinating. Now, just so nobody gets the wrong idea, I'm not saying that majoring in computer science is a waste of time. On the contrary, I had always planned on majoring in CS, but after realizing that I also love math, I changed my mind. Computer science is a great subject with a lot of really cool applications, but so is math. The difference is that I consider math to be a lot more difficult to teach oneself. The great thing about programming is that there is an overabundance of material available on the Internet that you can use to teach yourself anything you want to know. Also, programming languages and frameworks come with some of the best documentation that you could ask for. If you want to learn how to program, you can do so without ever leaving your computer screen. Math, on the other hand, is more difficult to learn (at least in my opinion). Of course you can learn math via the Internet as well, but there just aren't as many resources. This lack of resources makes for quite the learning curve. Having a degree in computer science will teach you things that will be useful as a programmer, but simply having the degree won't make you any better or any worse than someone who doesn't. Apple’s iPad 2 easily bests the HP TouchPad. On many levels, the iPad 2 delivers a more beneficial experience to any customer. iPad wins by a large margin on number and quality of apps. Pricing is a wash, but HP should have been aggressive in pricing the TouchPad under the iPad. iPad available in wifi and wifi+3G models; TouchPad currently only available with wifi - 4G promised for later this summer. Displays both 9.7 inches - HP missed an opportunity to differentiate themselves. The TouchPad works best if you own a WebOS phone - I don't see many of those. The TouchPad loses on size and weight. Questions still exist regarding the viability of WebOS in the enterprise. There is no 64 Gig TouchPad to compete with the 64 Gig iPad - important for media-centric users. For now, when someone thinks of a tablet, they think Apple and iPad. To be successful, HP needs to change that mindset. Erick Schonfeld attempts to explain Google Circles, with a little help from a Ross Mayfield slideshare presentation. The Circles feature is how Google+ handles groups, but it is not completely intuitive and problems can arise when different Circles collide It is designed to let members set up different groups of people, or Circles, to share things with. But Circles are one-way, or asymmetric. Everyone sets up their own Circles and nobody knows whose Circle they are in. Secret Circles would be a more apt description. Zuckerberg seems to be suggesting that they are not really groups because instead of everyone in the group knowing who else is in the group, it is the exact opposite: nobody knows which groups they are in. Circles are so confusing that Ross Mayfield created the Slideshare below to explain it all. Facebook has a “symmetric sharing” model where two people mutually confirm that they are friends, and then can start sharing stuff with each other privately or publicly. Twitter has an “asymmetric follow” model where people Tweet out publicly and anyone can follow what they are broadcasting without that person necessarily following back. It’s one-way. Google+, however, has an “asymmetric sharing” model where you can share one-way with people, but they don’t have to share back. It’s kind of like the Circle of Trust in Meet the Fockers (watch the video clip in the third slide), only not quite as funny. I don't buy Zuckerberg's law (see below) - I think it's wishful thinking. I don't think anyone has infinite capacity for social sharing - which is what exponential growth assumes. Instead, there is probably some human limit that will be approached asymptotically. Let's say I share 1 item/minute x 60 minutes/hour x 24 hours/day x 365 days/year – that's 525,600 items per year, assuming I don't eat, sleep, or do anything else but share. There's clearly a practical limit to how much a single individual can share. The network effect does compound the number of people I share with and could in fact be modeled as exponential growth - as my network grows and my networks' networks grow, I share with more and more people. But that's not what Zuckerberg is claiming - he's claiming that the amount of stuff I share will double each year. Zuckerberg explained that in accordance with Facebook’s data, social sharing functions exponentially, so that the amount of stuff you shared today is twice the amount of stuff you shared a year ago and the stuff that you will share a year from now will be twice the amount you’ve shared today. In Mark Zuckerberg’s Law of Social Sharing, Y = C *2^X –Where X is time, Y is what you will be sharing and C is a constant. Whether Zuckerberg’s concise prediction of human sharing behavior is accurate remains to be seen. As Chris Dixon points out, it seems kind of absurd that people will be sharing 1,048,576 (2^20) times the items of information they are sharing today twenty years from now. An interesting rumor from This is my next's Josh Topolsky. the new tablet is said to sport a double resolution screen (2048 x 1536), and will be dubbed the “iPad HD.” The idea behind the product is apparently that it will be a “pro” device aimed at a higher end market — folks who work in video and photo production possibly — and will be introduced alongside something like an iPad version of Final Cut or Aperture. -- "omg! I'll just read about it later. This is like water torture." -- "Im gona play solitaire if he doesn't get on with it"
-- "Someone needs to bump him to get him to stop saying UM"
-- "After this, I need an UM detox program.."
At one point, Zuckerberg -- forever the geek -- pulled up a chart about Facebook's projected growth, which he introduced as a "log-normalized graph." The Internet's collective eyes rolled back. Zuckerberg seems to have tried -- and failed -- to imitate the undisputed king of the tech presser: Apple's Steve Jobs, who is known for leaving even the most skeptical of tech bloggers in a "hypnotic daze" after he finishes a talk. "Zuckerberg at times appeared to be attempting to channel Steve Jobs in his presentation style," wrote Beatweek Magazine. "But too often he lost sight of the fact that most of his online audience members were from the non-geek general public." "Steve Jobs builds his presentations around our innermost needs and desires," one Twitter user wrote. "Zuckerberg builds his around normalized logarithmic charts." Watch the full episode. See more The Parent Show. Is Mobile on Your Radar? If it's not, you're missing out on a tremendous potential market. Also consider that 40% of this huge market will be digital goods. Colleges don't really think of themselves as selling digital goods, but online courses are our digital assets. What does digital mean? No buildings, no warehouses, no printing, distribution that scales easily from 200 to 200,000. Do we have the mobile infrastructure (apps, mobile web, network, mobile e-commerce) in place to support mobile? Do we have expertise in mobile? Do we have a critical mass of digital assets (modules, courses, programs, special events) that can be monetized? To really embrace digital and mobile you might need to abandon your current business model. Like Cortez, you might need to burn the boats. Unfortunately, for most in education, this is like the story of the boiling frog - you won't realize the old model is dying until it's too late. The music, movie, and publishing industries are compelling examples of what happens if you hold on too long to old world business models. Juniper Research is releasing a new study today that reports that the transaction value of mobile payments for digital and physical goods, money transfers and NFC (Near Field Communications) transactions will reach $670 billion by 2015, up from $240 billion this year. The top 3 regions for mobile payments (East Asia and China, Western Europe and North America) will represent 75% of the global mobile payment gross transaction value by 2015. Digital goods payments will account for nearly 40% of the market in 2015. "Information overload” is one of the biggest irritations in modern life. There are e-mails to answer, virtual friends to pester, YouTube videos to watch and, back in the physical world, meetings to attend, papers to shuffle and spouses to appease. A survey by Reuters once found that two-thirds of managers believe that the data deluge has made their jobs less satisfying or hurt their personal relationships. One-third think that it has damaged their health. Another survey suggests that most managers think most of the information they receive is useless. Does Your College Have a Plan for Mobile? 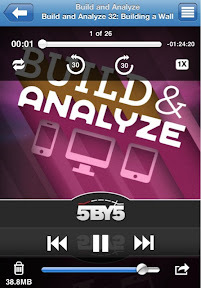 Michael Gray thinks Building a Mobile Website Should be Your #1 IT Project. He's focused on commercial websites, but the same is true for educational institutions (.edus). Have you even started? Great video from Mobile Monday (MoMo) Amsterdam. Some of the language is NSFW, but really good history or AR. A really good overview of augmented reality and where it should be heading by looking at the history and understanding of where we have been. A Bright Future for Renewable Energy? Some positive signs for renewable energy. Renewable energy production has surpassed nuclear energy production in the U.S. according to the latest issue of Monthly Energy Review published by the Energy Information Administration. Production of alternative energy is also beginning to close in on domestic oil production. During the first three months of 2011, energy produced from renewable energy sources (biomass/biofuels, geothermal, solar, hydro, wind) generated 2.245 quadrillion Btus of energy equating to 11.73 percent of U.S. energy production. During this same time period, renewable energy production surpassed nuclear energy power by 5.65 percent. In total, energy produced from renewables is 77.15 percent of that from domestic crude oil production. When looking at all energy sectors, production of renewable energy has increased by a little over 15 percent when compared to first quarter of 2010, and by more than 25 percent when compared to the first quarter of 2009. Of this total, biomass/biofuels accounted for approximately 48 percent of this total followed by hydropower at 35.41 percent, wind at 12.87 percent, geothermal at 2.45 percent and lastly solar at 1.16 percent. The growth in renewable energy coupled with initiatives such as this summer camp hosted by FLATE - The Florida Advanced Technological Education Center point to a bright future. ... organizations like FLATE are stepping up education and workforce development efforts to help meet Florida’s 2020 energy strategy (More information at FESC). This summer FLATE held, for the first time, energy camps for teachers and students. The camps were held June 20-23 at the South Shore Campus of Hillsborough Community College, and involved 14 students from Beth Shields Middle School in Ruskin, and 17 high school teachers from 12 schools in Hillsborough County, FL. The energy camp for students, a pilot project funded by the AVID (Advancement Via Individual Determination) program, was funded through FLATE and FESC (Florida Energy Systems Consortium) a consortium of Florida college and universities established by the Florida Legislature, and was part of a network of energy-related camps that are being offered simultaneously at Tallahassee Community College, and Florida State College at Jacksonville. The camp featured a number of hands-on activities that included: greenhouse gas simulation exercises; demonstrations of Jensen electric generator; photovoltaic, magnets/magnetic fields demonstrations, and demonstrations of wind and fuel cell car technologies. Emely Ramirez and Brian Sanchez, seventh graders at Beth Shields Middle School said the activities were “fun and cool, yet challenging.” Other hands-on activities included constructing a simple motor, a windmill generator, and conducting a test run baking cookies using a solar oven. What's Wrong With My System Security? Out-of-date plug-ins are the biggest security vulnerability, according to a new study conducted by security management company Qualys. In a new analysis of the company’s BrowserCheck Tool, researchers found that video and general use plug-ins were the most common vulnerability in most of the 420,000 random scans. Java, the most vulnerable plug-in, was installed on 80% of browsers and half of those were running out-of-date versions of the software. Flash video, vulnerable on 20% of browsers. Best bet: Remind users that those “ready to install” updates aren’t just annoying pop-ups. The patches are designed to make sure software isn’t exploiting your system. The wrinkles that develop on wet fingers could be an adaptation to give us better grip in slippery conditions, the latest theory suggests. I love math, but this is just wierd. At the auction for Nortel Networks' wireless patents this week, Google's bids were mystifying, such as $1,902,160,540 and $2,614,972,128. Math whizzes might recognize these numbers as Brun's constant and Meissel-Mertens constant, but it puzzled many of the people involved in the auction, according to three people with direct knowledge of the situation on Friday.